The March Challenge for the Island Batik Ambassadors was "Vintage Reimagined": Take inspiration from a vintage quilt and make it your own. This is my original creation Vanishing Stars. 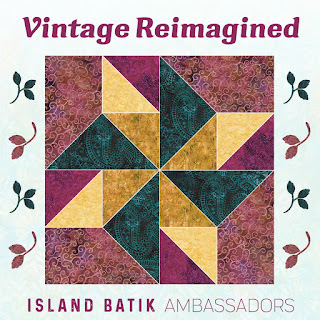 The materials I used in this project were given to me by Island Batik as part of the Ambassador program. Thank you to Island Batik, Aurifil and Hobbs Batting. 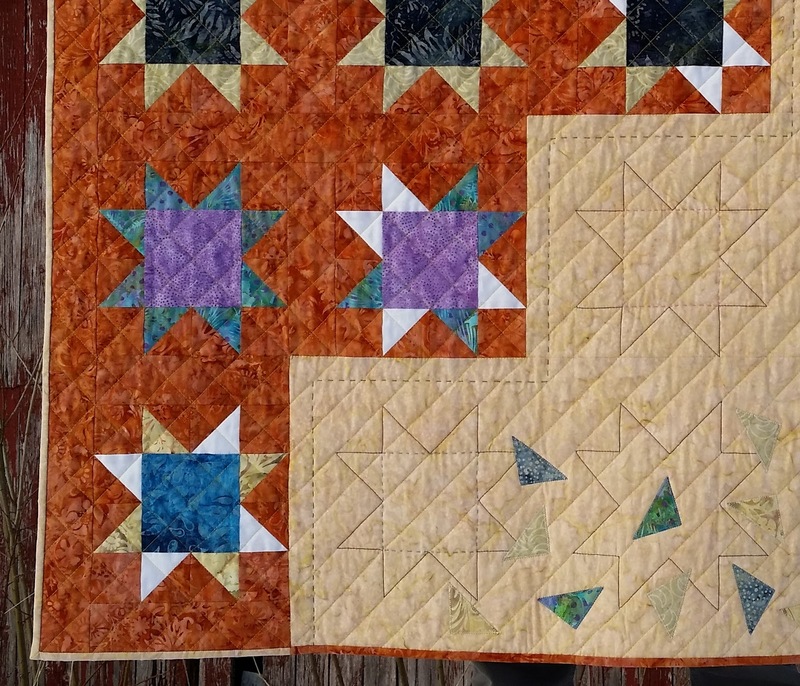 The Sawtooth Star has always been one of my favorite quilt blocks. There are a vast amount of vintage quilts that have used these blocks. The first blocks laid out on my porch. A late polar low pressure dumped a lot of snow over us, so we are still longing for spring. 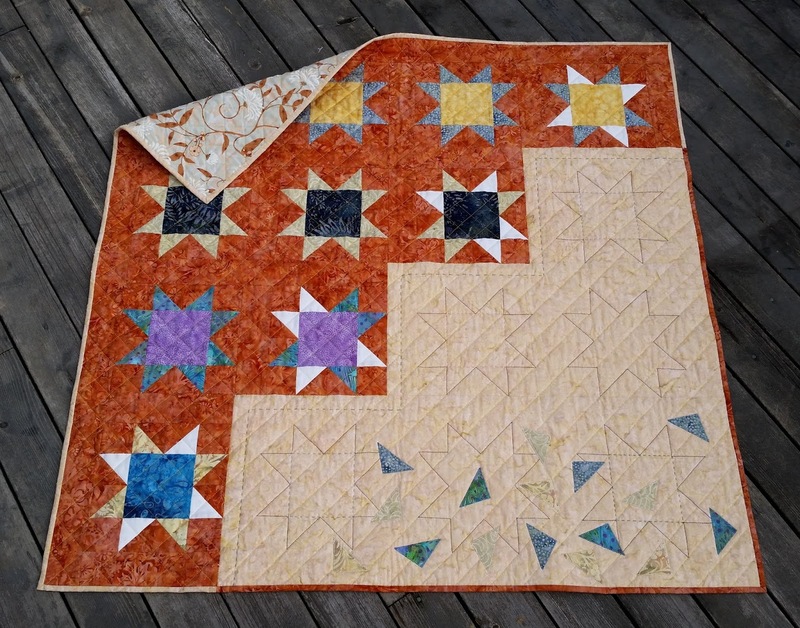 My inspiration for the quilt was to start with a full line of stars on top, but with "shedding" star petals on the star in each row (here shown in solid white). The shedded petals would end up in a pile at the bottom. The gradually receding lines of pieced stars moves towards subtle, disappearing stars. The background fabrics are from last year's Ambassador box, they give a vintage feel to the quilt. 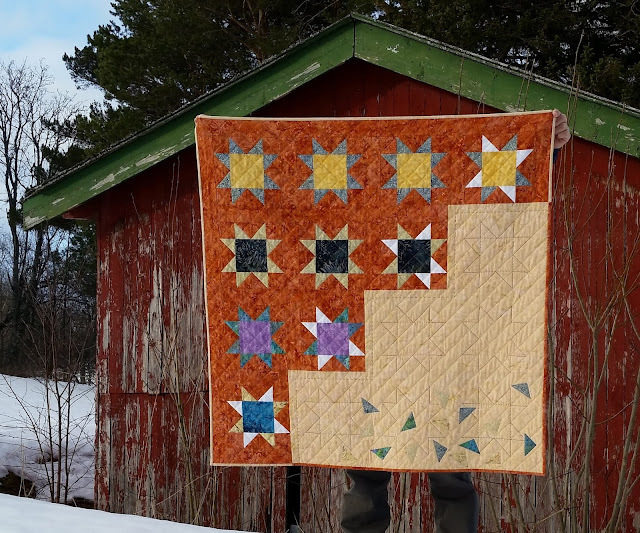 The stars are made from Stash Builder batiks and other remnants. The negative space gives lots of freedom for quilting. 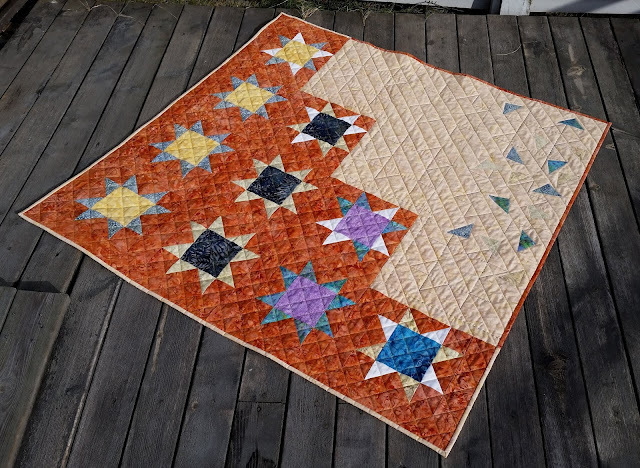 The background batik for the main part of the quilt, appropriately named Cherwell Copper Vintage, gives a perfect contrast to the pieced stars. 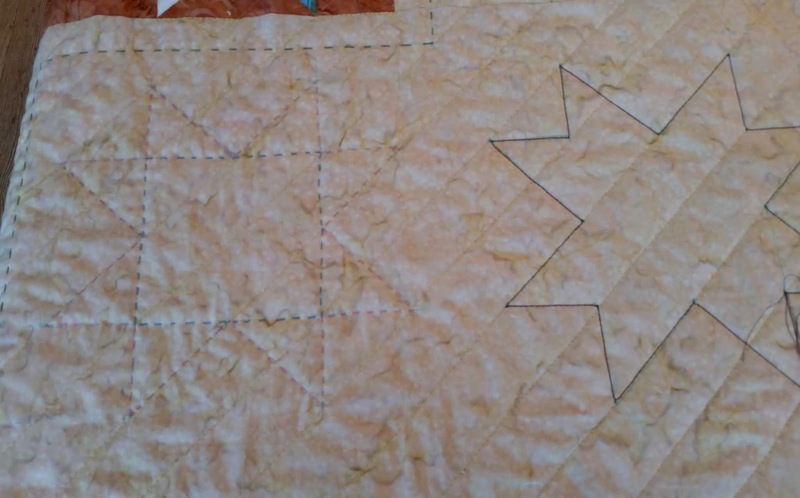 I chose to quilt this part with a crosshatch pattern using a golden Aurifil 50wt thread (5015). Cotton batting from Hobbs gives perfect loft to the quilt. 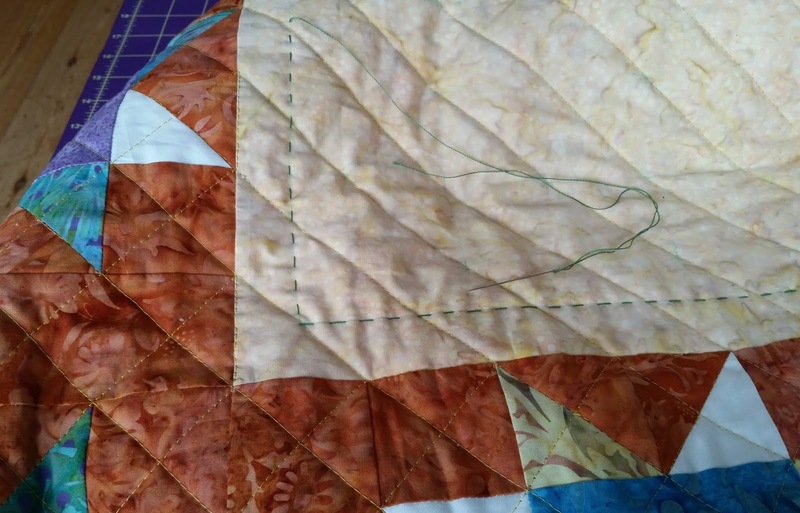 For the lighter background I quilted diagonal lines in the same thread, with the same spacing. All lines marked with my Hera marker. Big stitch hand quilting with Aurifil 12wt 2890 makes the transition from the 'complete' star area to the more subtle stars. Hand quilting gives another vintage feel of the quilt. 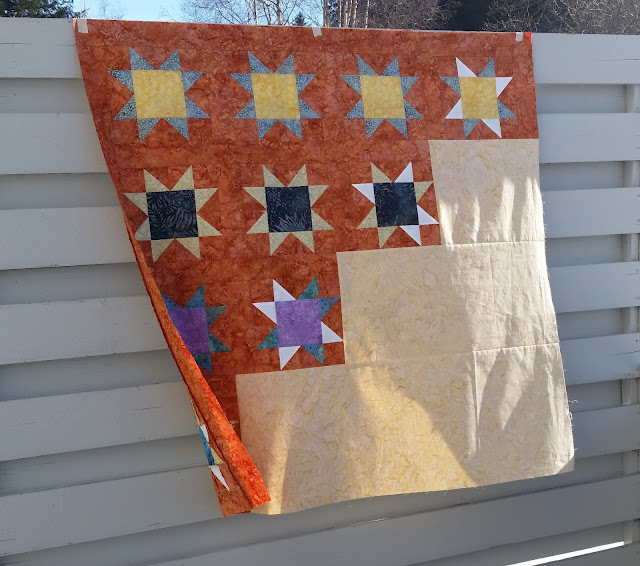 I had great plans for the negative space, the original idea was to hand quilt the outline of the sawtooth stars with Aurifil 12wt threads. In the picture above I had done this with the star to the left, but I felt that there was too little contrast with the background using the thread I had available. Instead I tested out machine quilting with Aurifil 28wt in a darker color (2568), shown at the right. This gave a much better result, so I pulled out the hand stitching from the first star. Later I added some hand quilting with Aurifil 12wt to a few of the the negative stars. Above is a detail from the lower left corner of the quilt. 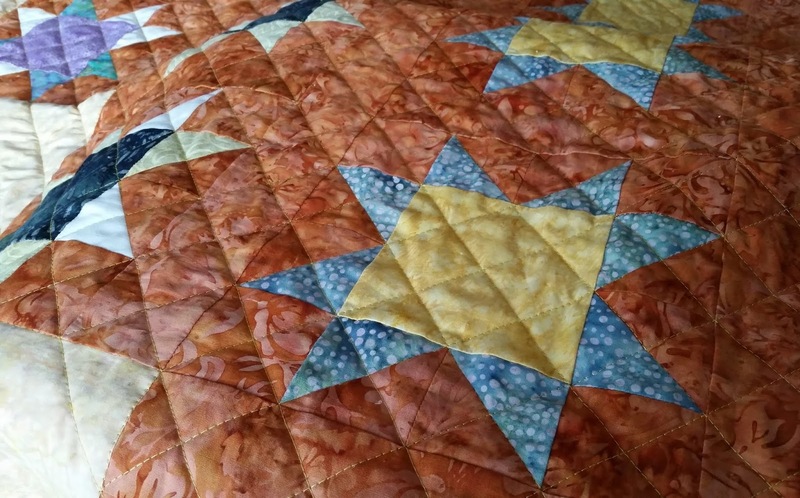 The outline of the negative stars is clear, and the added hand quilting gives a nice effect. The fallen star petals are clearly shown, some are more subtle than others. For the binding I cut 2" wide strips of both background fabrics, made double fold binding and added the light binding to the darker background and dark binding to the lighter background. This gives a modern touch to the quilt. The quilt spread out on my porch. 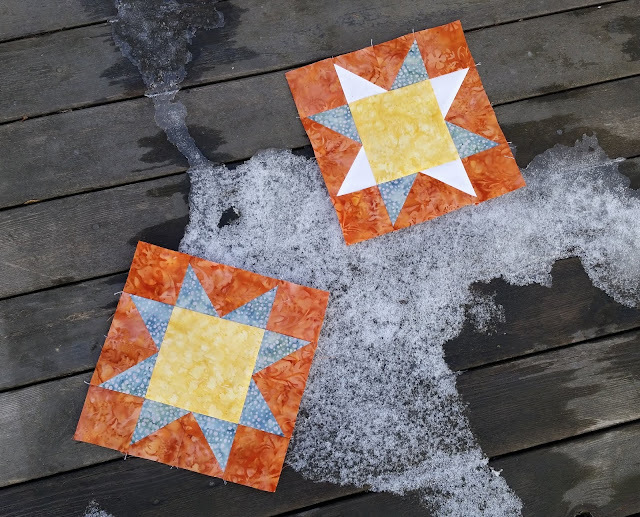 After quilting my Vanishing Stars is 41.5" square. Here are all the Aurifil threads I used for piecing and quilting. 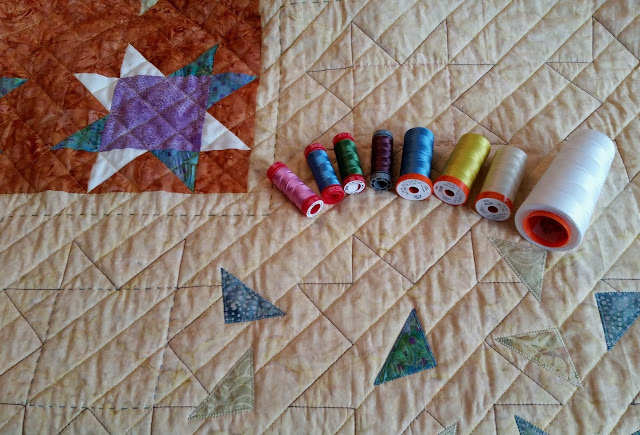 The thread is a joy to piece and quilt with, and a nice side effect is the minimal amount lint it gives. The last picture shows how much snow we still have. The picture was taken yesterday afternoon with low, golden sunlight and a dramatic sky for backdrop. 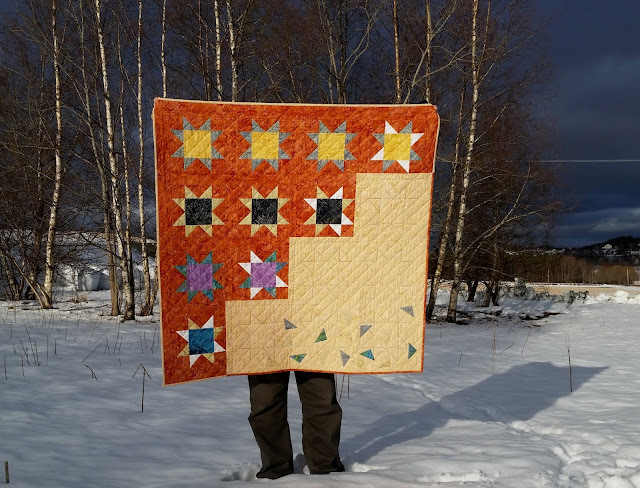 The quilt glows!